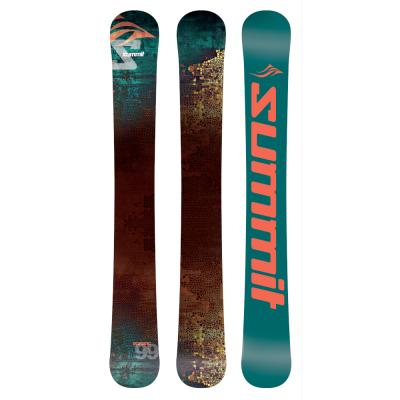 Summit Ecstatic 99cm 3D Skiboards SC 2019 - multiple binding options. 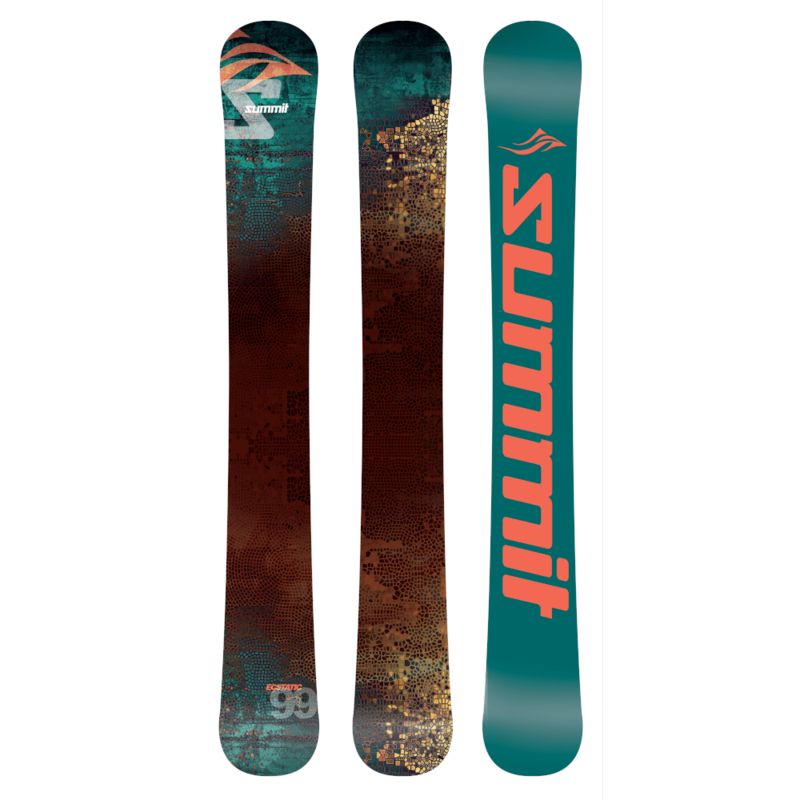 Summit Ecstatic 99cm 3D Skiboards SC 2019 – these skiboards are still the best 99 cm skiboards ever produced. Pure adult fun on the slopes. Discover why we call these Ecstatic! 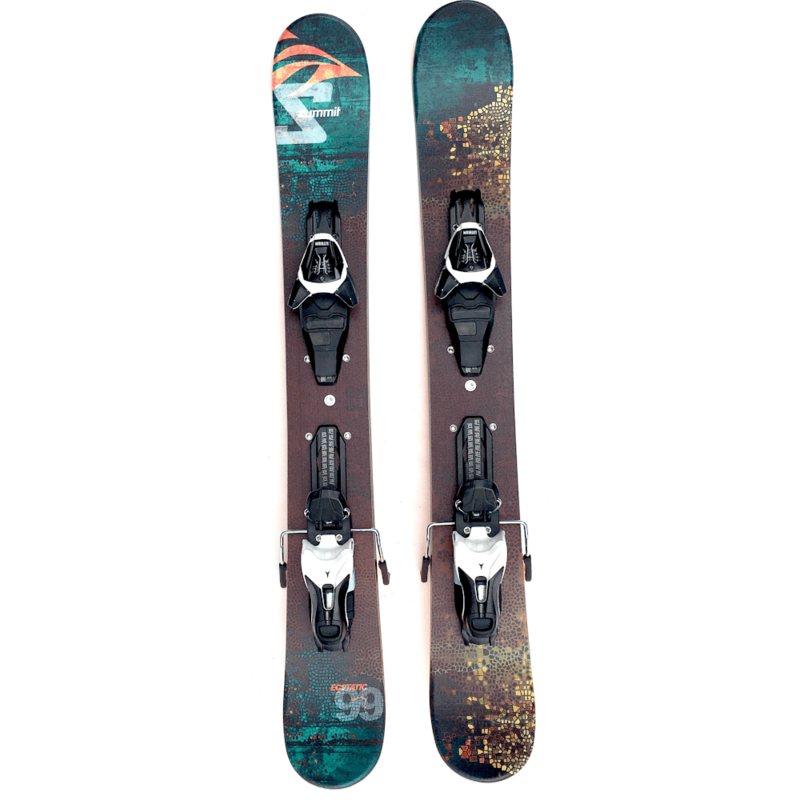 The Summit Ecstatic 99cm 3D Skiboards SC 2019 are super energetic skiboards for quick, easy turns, stabilility at speed, symmetrical twin tips for spinning and playing on the mountain. Constructed specifically for all mountain riding, the wide body shape is equally at home on the groomed runs as well as in the crud or simply floating through powder. These skiboards are still the best 99 cm skiboards ever produced. Summit skiboards are designed with one goal in mind – to take the sport of skiboarding to a new level of performance. These new Ecstatics are going to let you push the limits of what you thought was possible on the ski slopes. Handcrafted, one pair at a time, with extreme attention to detail, the Summit Ecstatic 99cm 3D Skiboards SC 2019 feature a vertically laminated tip-to-tail northern birch wood core and parabolic sidecut. New this year is a hybrid ABS Sidewall/Cap (SC) construction. This construction allows for maximum performance and stability at speed, holding an edge no matter how hard you charge it. Cap construction is used in the front and rear for greater durability. Go ahead, lay it over and drag your hand on the ground and experience the thrill that these skiboards can provide. Smooth, rock solid performance and incredible stability at speed. Designed for true all mountain riding, these handcrafted skiboards will take you into those breath taking steep chutes or flying through the glades in total control. The wide body platform delivers great floatation in the deep stuff, offering awesome performance for something this size. You can lean hard on the back tails and they are going to support you, a true comfort to know during those deep powder days. Edges hold even on ice. Symmetrical twin tips make it easy to ride forwards and backwards or just spin down the mountain. No matter what you choose to take on, the new Summit Ecstatic 99cm 3D Skiboards SC 2019 are simply made to push the envelope of what you thought was possible on skiboards. Bases are florescent and glow off the snow! Recommended for: advanced and intermediate riders and beginners who are ready to take a quantum leap in their ability level. Excellent for: groomed, moguls, quick turns in the glades, fun in the parks and just pure play. Tuning: These require a hot wax. 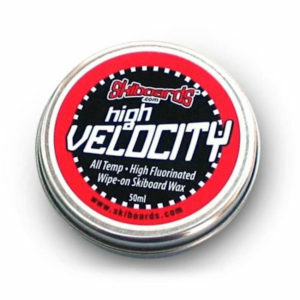 You can have us provide our hot wax service before we ship or we suggest the Quick Mini Tune Kit to do yourself. Base color will vary between Green with Orange lettering or Orange with Green lettering. 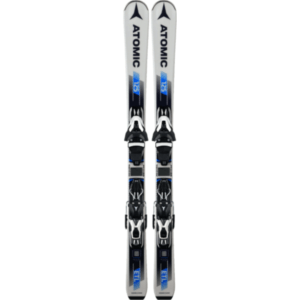 Step-in Release: The Atomic FFG 12 High Performance release bindings. The new Salomon Z12 step-in release bindings are high performance, automatic bindings with a DIN of 4-12. This binding is slightly oversize with extra long wings for great lateral transmission, yet rides lower on the skiboard (height 16.5 mm). If you ride your skiboards hard, in moguls, parks or wherever, these are the bindings you want. Boot size range is 260mm to 384mm (approx. 4-15 US). Snowboard Bindings: We recommend the Technine Custom Pro DS Snowboard Bindings with Summit Riser kit for high performance with snowboard boots. These were designed by us to work perfectly with skiboards, while allowing you the comfort of using snowboard boots on your skiboards. For 5 years running now, these have a proven track record of skiboard performance with snowboard boots. The Custom Snowboard bindings feature 3 padded rachet straps to hold you in place when carving. This allows a more stable interface between boots and bindings. Includes two Quick Leashes by Five-Forty ($9.90 value) and Summit Snowboard Binding Riser Kit. Fits snowboard boot sizes 7-14 US. Now Use your own Snowboard Bindings and Snowboard Boots. 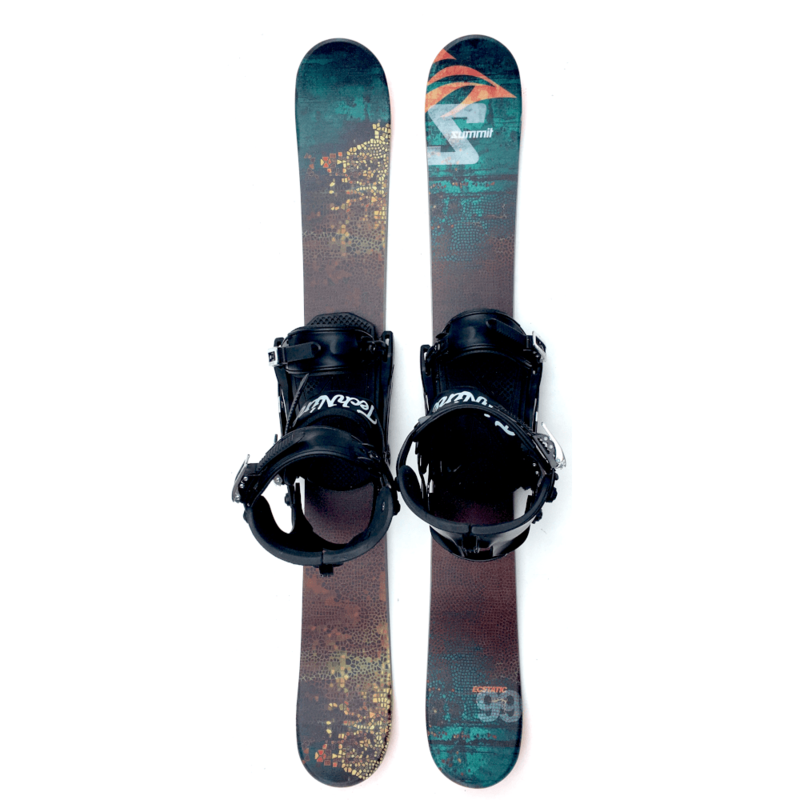 Order the Snowboard Binding Adaptor Kit and then purchase these without bindings. This is all you need to use your own snowboard bindings. Non-release performance bindings: Any standard 4X4 insert pattern skiboard bindings will work great with the Ecstatic 99 skiboards. Cap/Sidewall Construction: The high energy, lively wood core is sandwiched between two top layers of triaxial fiberglass, a layer of Kevlar and a bottom layer of triaxial fiberglass providing just the right combination of flex and torsional stiffness that offers an incredibly smooth ride. In addition, an extra layer of biaxial fiberglass is added to maintain the smooth tip-to-tail flex allowing just the right carving feel. A layer of rubber dampening makes for vibration absorption while still allowing for maximum “road feel”. With cap/sidewall construction, the Ecstatic provides of sidewall for stability with durability of cap construction front and rear. Among these advantages are increased torsional stability, greater edge protection, enhanced power transfer to the edges, additional vibration dampening, greater strength and reinforce the full length flex from tip to tail. Stainless Steel inserts: 4 stainless steel inserts are centered within each skiboard, in a standard 40 X 40 mm skiboard binding mount pattern for non-release bindings. A centered stance gives you greater flexibility in customizing your preferred riding position. This also increases the retention strength of the bindings and allows for quick and accurate mounting, making it easy to interchange with other 4 hole pattern bindings.